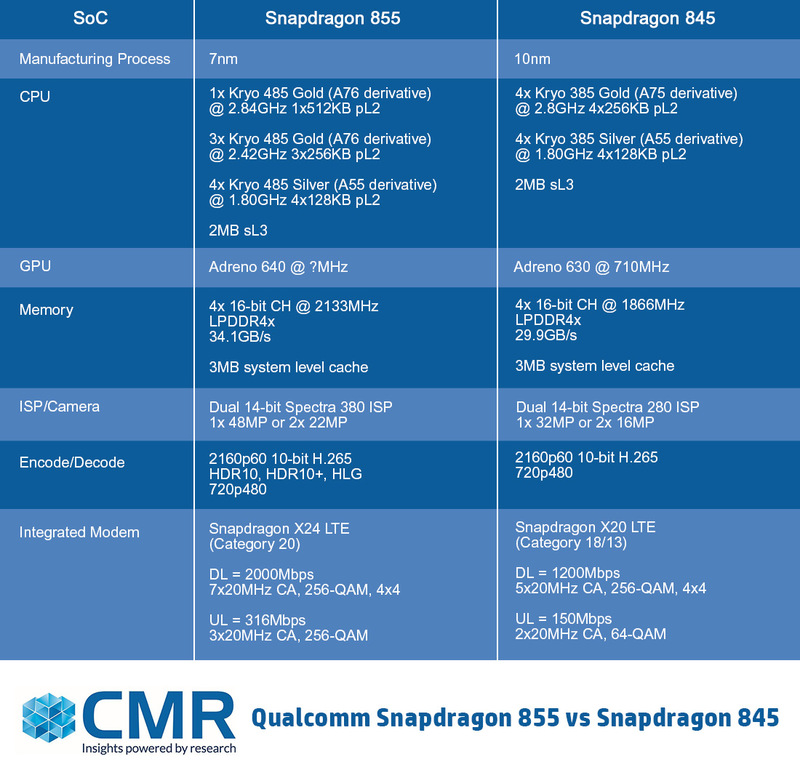 During the second day of the Snapdragon Technology Summit 2018, Qualcomm introduced the newest generation in the 8 Mobile Platform Series, the Snapdragon 855 Mobile Platform: the world’s first commercial mobile platform supporting multi-gigabit 5G, industry-leading AI and immersive extended reality (XR) in the 2019 generation of premium Android flagships. The Snapdragon 855 will change the user experience, much beyond just mere speed and battery boosts. How would the overall user experience be with the 2019 Android flagships? What about the gaming experience? How would shooting photos and videos be like? What will be watching movies be like? These are some of the questions that this blog addresses. At its Snapdragon Summit, Qualcomm’s partners, including Samsung, OnePlus, Verizon and AT&T shared their proposals for 5G devices and networks in 2019. The new Snapdragon 855 will power nearly all of the premium Android flagships from all major handset makers, including the forthcoming Samsung Galaxy S10 from Samsung. Alongwith a refresh of the SoC IPs, and new chip architectures built on leading 7nm process technology, Snapdragon 855 will provide longer-lasting battery life and superior user experiences, than ever before. The Snapdragon 855 Mobile Platform brings forth transformative 5G experiences leveraging the Snapdragon X50 5G modem, while harnessing the best in multi-gigabit 4G connectivity with the built in Snapdragon X24 LTE modem. With Snapdragon X50, the 855 platform supports 5G for both Sub-6 GHz and mmWave frequency bands, providing blazing-fast responsiveness and unprecedented speeds. Users can expect up to 20x faster average performance, enabling next-generation immersive experiences, including multiplayer VR gaming, AR enabled shopping experience, and real-time video collaboration. In addition, Snapdragon 855 will also sport the powerful next generation Wi-Fi performance via the Qualcomm Wi-Fi 6-ready mobile platform, which promises to bring about increased throughput and faster speeds. Snapdragon 855 also supports wireless buds by optimization of low latency between left and right earbuds as well as lowering the power consumption. This allows for longer listening time per battery charge. Snapdragon 855 promises much more faster speeds and better performance. Qualcomm claims that the Kryo 485 CPU will be 45 percent faster than the Snapdragon 845, while the new Adreno 640 GPU will provide up to 20 percent faster graphics. Snapdragon 855 features the 4th generation multi-core AI Engine, supposed to offer a total capacity of more than 7 trillion operations per second (7 TOPs), and 3x the AI performance over the 845. The 4th gen Qualcomm AI Engine software suite offers many enhancements to the Qualcomm Neural Processing SDK, Google’s Android NN-API, and to both Hexagon NN and the Qualcomm Math Library. Many different optimized network precisions and neural network classes are now available to support the surge of on-device AI voice, camera, gaming and XR user experiences. The 855 also supposedly offers a more advanced on-device Voice Assistant using dedicated AI acceleration for echo cancellation and noise suppression, so users can talk to their Voice Assistant device at any time. In essence, whether it be AI-powered facial recognition or AI-enabled contextual suggestions, the Snapdragon 855 should be more swifter. When it comes to smartphones, the camera has been the key battleground for handset makers. In a smartphone-first world, its no surprise that consumers are also focused on the smartphone camera. Given that, its apt that the new 855 will provide new photography updates that could result in more amazing photos and videos. The new Qualcomm Spectra 380 ISP integrates numerous hardware accelerated computer vision (CV) capabilities to enable cutting-edge computational photography and video capture features while offering up to 4x power savings. The CV-ISP includes hardware-based depth sensing which enables video capture, object classification, and object segmentation all in real-time in 4K HDR at 60fps. Users will be able to capture a video and accurately replace selected objects or backgrounds in the scene in real-time, all with 4K HDR resolution using over 1 billion shades of color. Finally, to store all these data more efficiently store this amazing content, the Snapdragon 855 also features hardware acceleration for the HEIF file format encoding, making files 50 percent smaller. This enables efficient saving and sharing of user generated content. To top it all, Snapdragon 855 offers consumers with an upgraded entertainment platform for more realistic gaming, improved cinematics, and higher performing XR. With the new 855, even the most demanding games will run smoother, thanks to custom algorithms that will reduce dropped frames by >90%. In addition, multiplayer gaming also gets improved via reduced latencies. When it comes to the audio experience, it has been upgraded with the new Qualcomm aptX Adaptive that provides the ultimate wireless listening experience. Consumers will also benefit from the enhanced cinema experience that enables HDR10+ playback, and watch more movies on a single charge. Lastly, consumers can expect immersive VR experiences at 8K resolution via the 855. The Snapdragon 855 supports the new Qualcomm 3D Sonic Sensor, the world’s first commercial ultrasonic fingerprint solution supported under the display, that can accurately detect fingerprints even when they are dirty. In addition, this technology enables sleek, cutting-edge form factors with higher security and accuracy levels. Qualcomm’s Snapdragon 855 marks an important first step towards the 5G era, and 5G is almost here, right now. The 855 offers smart architecture coupled with sheer computing power to enable the demands consumers make on their smartphones. With the first wave of smartphone flagships featuring the 855 shipping potentially in the first half of 2019, we would not have to wait long to see the promise of 855 for real. Telecoms2019.04.17In the Apple-Qualcomm Deal, Pragmatism Triumphs! Telecoms2019.03.18What’s the Outlook for 5G-Capable Phones in India?